Lefkada island is one of the islands in the Ionian sea. It is on the west side of Greece and it is probably one of the few islands in the world that is accessible by car instead of boat! The truth is that you could travel by boat or plane as well, but if you happen to be in the mainland or in one of the neighbouring countries, car is the most popular way to visit Lefkada. This is actually the reason why it has become one of the top destinations for the Greeks of mainland Greece. You must be wondering how it is possible to travel to an island by car. Well, this island in particular is connected with the Greek mainland with a floating bridge. The island is very close to the shore, therefore the journey is a fast and cheap experience. You don’t often visit islands this way, why not give it a try! Lefkada covers an area of approximately 300 square kilometres, thus being the fourth largest island in the Ionian Sea and the closest to the mainland. It is just 78 metres away from the west coast of central Greece, from which it is separated with the channel of Lefkada that is 25 metres wide. Nowadays, there is a floating bridge which links the island to the mainland and makes it accessible by car through Akarnania. It is a little less than 400 kilometres away from Athens and there are daily buses running from Athens and Thessaloniki to Lefkada. The name of Lefkada probably derives from the word “lefkos” – in Greek it means white - and it is due to the white colour of the mountains on the south-west side. 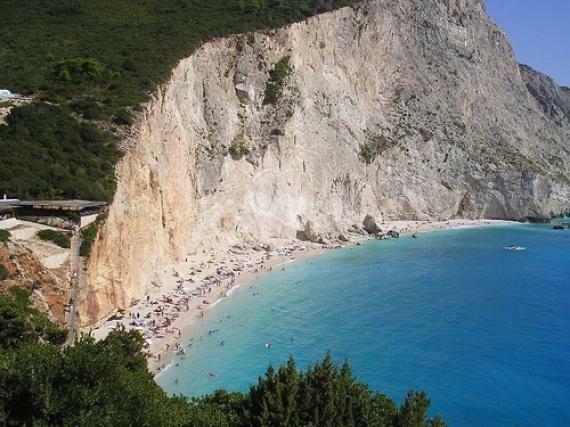 The population of the island is 22,652(2011), with 1/3 of it living in the town of Lefkada. Seventy percent of the terrain is mountainous with steep cliffs especially on the west side, while on the east side, the landscape is flatter. There is a sea path opened by the Corinthians in the ancient times and developed by the English in 1818 which leads the boats from the calm lagoon of the east side to the open waters of the Ionian Sea on the west side. The island is verdant with trees like olive, pine and plane trees and there are also many springs, such as the Kerasia spring in Sivros. The waterfalls near Nidri, the Dimossari gorge and the salt marshes found on the island are indicative of the marvels of the nature one comes across on Lefkada. The island is also famous for its impressive beaches, with the white sand and turquoise waters which resemble to the Caribbean. The coastline is 116 km long and forms oblong capes and bays, particularly in the south. The climate is Mediterranean with mild but rainy winters and warm summers with cooling breeze. The average temperature is 18 degrees, with July being the hottest month and January the coldest. The winds that blow from May till September make Lefkada an ideal destination for yachting and windsurfing. The economy of the island is based on the production of olives and pulses, particularly lentils, the beekeeping, the production of salt and tourism.